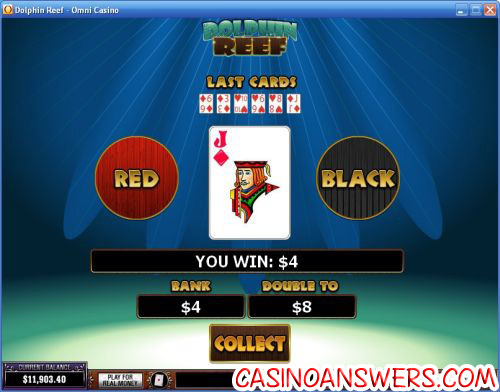 Dolphin Reef Video Slot Guide & Review - Casino Answers! Dolphin Reef is a 5-reel, 20-line video slot from Playtech. It has scatter wins, wild subsitutes, expanding wilds, free spins and a gamble feature. You can play Dolphin Reef at Europa Casino and Omni Casino.Play at this years #1 online casino for United States - Slots.LV. Dolphin Reef has a basic autoplay feature. You must click the “+” button for every spin you wish to play, as opposed to holding the button down. You can autoplay up to 99 spins at a time. 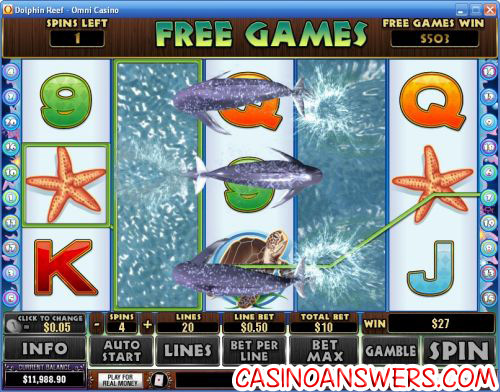 Have 5 fishes appear on Dolphin Reef and you will win the top jackpot of 5000X your line bet. The turtle is another major win – five of him in a row will win you 1000X. The best part is you can gamble these wins to win double your money! After you get a win on Dolphin Reef, you can play the Gamble feature. There will be a card face down and you must choose red or black. Choose the correct colour and you will double your winnings. Choose wrong and you will lose your winnings. The double up limit is $50. The last six cards are displayed near the top. Hit the Collect button at any time to return to the main game. Hit the Dolphin wild substitute on reels 2 and 4 and win 5 free games and expanded wilds. Wins on during free spins are paid based on the triggering spin. Reels 2 and 4 will expand. All positions on reels 2 and 4 substitute for all symbols including the scattered chest. The remaining reels (1, 3 and 5) will be re-spun 5 times. The expanded wilds on reels 2 and 4 each count once only to the scattered chest pays. Free spins will be added to the payline and scatter wins. The Dolphin symbol will substitute for all symbols. Dolphin Reef has got excellent presentation along with some interesting and innovative bonus features. It can be played at Europa Casino, where you can get a $2,400 signup bonus. Where can USA players play the Dolphin Reef video slot? Unfortunately, Playtech casinos are off limits to players based in the United States. For some great video slots that US players can enjoy, please visit Aladdin’s Gold Casino. Does Dolphin Reef have a bonus game? Dolphin Reef has a gamble feature that can be played after any win on the slot machine. The goal of the game is to guess the colour of a face down card. Guess correctly and you will double your money. Guess the card incorrectly and you will lose your winnings. What casinos have the Dolphin reef slot machine?